Download the iOS or Android App and place mobile bets from your tablet or smartphone. Coral is a longtime presence in the bookmaking business because it has been around for nearly 100 years. In addition to its online offerings, the company has a chain of retail betting shops throughout the UK. To enhance the experience even more, the Coral app puts sports betting in the palm of your hand. You can join Coral’s Bet and Get Club, build your bets by getting instant pricing, cash out or do partial cash outs on hundreds of markets, and take advantage of a new customer offer that gives you free bets worth up to 20 GBP if you place a 5 GBP each way bet on any sport with odds of 1.5 or greater. All you must do is make the minimum 5 GBP deposit and place the qualifying bet to receive your award in the form of four 5 GBP bets. The promotion is open to UK and Ireland customers 18 years of age or older, but the app is available to all eligible players. There isn’t a specific Coral promo code for app users, but app users can take advantage of the new 20 GBP customer offer that is offered to all customers. The offer is better than a 100% bet match because you receive 20 GBP for betting just 5 GBP. Win or lose, you get the free bet. As for the app, it has everything that you need to manage your account. You can take advantage of the new customer offer, place your bets, and cash out. Everything that you would do on a computer or through your mobile browser can be done using the app. Of course, you can choose to play using the app or the mobile browser. The promotions are the same, but the experience is somewhat different because the app is made specifically for your mobile device. The easy-to-navigate interface is accessed by simply touching an icon on your phone’s screen. Register for an account on your mobile phone, computer, or by phone; make a minimum deposit using any method but Moneybookers, Neteller, Skrill, or Paysafe; and place a 5 GBP each way bet on any sport with odds of 1.5 or greater. Do all of this and qualify for the free 20 GBP in free bets. Of course, you must be 18 years of age and older and a resident of Ireland or the UK to receive this promotion. Coral is very strict on what it considers a “qualifying bet.” It can’t be a bet if it is wagered on Pools or Tote. If a bet is void for any reason, it won’t be considered a qualifying bet. However, you don’t have to wait for the initial bet to settle because Coral will immediately credit the bets to the account after the initial bet is made. Once you receive the free bets, you must use them within four days of them being credited to your account. If you don’t use them, they will expire. You can only cash out winnings from the free bets, but not the free bets themselves. Use your free cash on Single, Double, treble, Accumulator, 4-Fold and Upwards, Forecast and Combination bet types. You can’t use your free bet on Totes, Jackpot, Combination and Multiple Bets. You can register for your account before or after you download the app. To register, simply provide the information requested on the registration form. When downloading the app, you can search “Coral Sports betting” in the Apple App Store, Google Play, or the Microsoft App store to download in one click. If you’re already registered, input your login credentials into the app and you are ready to go. Customers making deposits with Neteller, Skrill, Moneybookers, or Paysafe won’t qualify for the free bets bonus. You can make your deposit using Visa, MasterCard, PayPal, Eco, or Coral Connect. The minimum deposit is 5 GBP unless you deposit using PayPal, which is 10 GBP. You will have to have at least 5 GBP in your account to place the 5 GBP qualifying bet. To activate the bonus, you must place a 5 GBP each way bet on any sporting event with odds of 1.5 or greater. The four free 5 GBP bets totaling 20 GBP will be instantly credited to your account. The promotion is only open to UK and Ireland residents 18 years of age and older. You will have four days to use your bets. Each bet must be wagered in full. You can use your free bets on Single, Double, Treble, Forecast and Combination, and 4-Fold and Upwards Accumulator. The free bet value isn’t included in any winnings, so you can’t cash out the free bet. There are other promotional offers, including additional new customer offers for certain sports and the virtual sports welcome offer that’s available only certain times of the day. However, promotions can’t be combined with offers in the same category. For existing customers, nonetheless, there are great promotions running all the time. You can get money back on horse racing, double winnings on specific events, get 10% more winnings with Acca Boost, watch events for free, get the best price guaranteed, and get free bets through the Bet and Get Club. Bet and Get Club promotions are available until 11:59 p.m. on the Sunday night of the offer week. 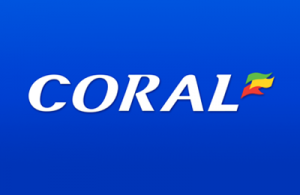 Coral doesn’t have the greatest number of payment offers, especially since deposits made using Paysafe, Moneybookers, Skrill, and Neteller are excluded from the promotion. However, qualifying deposits include Visa and Maestro debit cards, Visa and MasterCard credit cards, Eco, and Coral’s own Coral Connect. Coral Connect can be used online or you can stop by one of Coral’s many shops. Minimum deposits are 5 GBP except for PayPal at 10 GBP. The money will appear in your account instantly. The same deposit methods can be used for withdrawals with the exception of bank transfer. Each withdrawal method has a minimum of 5 GBP. Credit and debit cards can take up to 5 working days to process. PayPal, Skrill, Neteller, and Eco can take up to 24 hours. Bank transfers can take up to 5 days. Reliable or Scam: How Safe is the Coral App? Coral is regulated by the Gibraltar Gambling Commissioner and licensed by the Government of Gibraltar. The company is also licensed and regulated by the UK Gambling Commission. Strict licensing requirements must be met for a sportsbook to hold these credentials, including having measures in place that prevent underage gambling and also help customers who may be developing or have developed a gambling addiction. As for the app itself, it holds a 4.2 out of 5 rating in the Apple App Store. However, it has a 2.8 out of 5 rating in the Windows App Store. The interface is somewhat different between the different applications, so the experience can be different depending on the device being used. Overall when using the Coral App, you get another doorway to a wide range of great features and the many promotions available to new customers and existing ones. The 20 GBP in free bets just for placing a 5 GBP each way bet on an event with odds of 1.5 or greater is a better than average free bet promotion. Free bet promotions usually match a deposit or bet amount, but this one quadruples the initial bet and doesn’t have strict betting requirements. With the app, you can enjoy the promotion no matter where you are in the world as long as you have an internet connection. How do I get the Coral app? You can click the Apple App Store, Google Play, or Windows App Store icons from the Coral website or search “Coral Sports Betting” from the search field in your device’s app store. Click the button to download the app and it will download to your device. Simply open the app to register or sign in. Do I need a Coral promo code? No, but it is best for you to choose your promotion from the promotions page on the site. Click the “More Info” button and the “Join Now” button for that promotion. This is the best way to ensure you get the promo that you want. Is there a mobile-specific promo? There are no mobile-specific offers for app users. However, customers can use any of the promotions available on the promotions page.